Thin Blue Line Board Shorts for Men - ReLEntless Defender carries a variety of comfortable and stylish police-related board shorts for men. 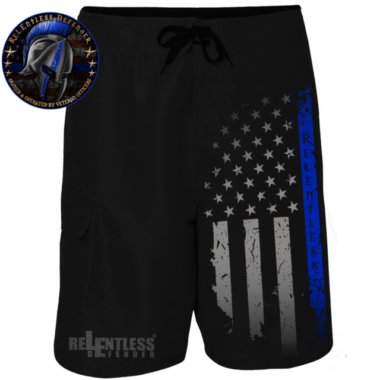 These shorts are available in your choice of the Thin Blue Line American Flag design or oversized ReLEntless Defender text so you can represent your loyalty, support, and pride even on the hottest day of the year. To ensure superior quality and durability, our board shorts are made from 100% polyester. Our collection features modern fit Thin Blue Line shorts and ReLEntless Defender board shorts in bold and neutral colors. For utility, shorts feature a drawstring closure, a spandex fly, and a handy cargo pocket on the right leg. 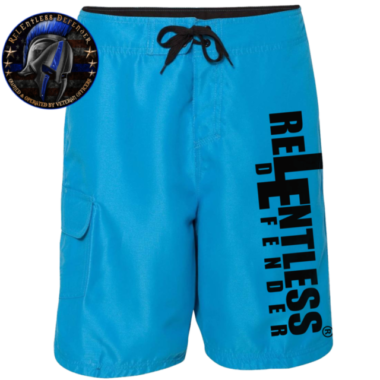 Available in a range of sizes including 30, 32, 34, 36, 38, and 40, find your next pair of Thin Blue Line Board Shorts at ReLEntless Defender.